Question: What is Amazon EBS Snapshots? You can back up the data on your Amazon EBS volumes to Amazon S3 at any point of time knows as snapshots. When you delete a snapshot, only the data unique to that snapshot is removed. Each snapshot contains all of the information needed to restore your data. Question: What is enhanced networking on Linux? Enhanced networking uses single root I/O virtualization (SR-IOV) to provide high-performance networking capabilities on supported instance types. SR-IOV is a method of device virtualization that provides higher I/O performance and lower CPU utilization when compared to traditional virtualized network interfaces. Question: What is Spot Instances? A Spot Instance is an unused EC2 instance that is available for less than the On-Demand price. Because Spot Instances enable you to request unused EC2 instances at steep discounts, you can lower your Amazon EC2 costs significantly. The hourly price for a Spot Instance is called a Spot price.The Spot price of each instance type in each Availability Zone is set by Amazon EC2, and adjusted gradually based on the long-term supply of and demand for Spot Instances.Your Spot Instance runs whenever capacity is available and the maximum price per hour for your request exceeds the Spot price. 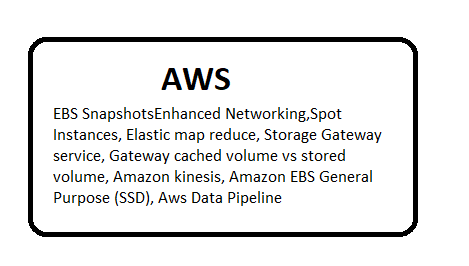 Question: What is Amazon elastic map reduce? Amazon EMR processes "big data" across a Hadoop cluster of virtual servers on Amazon Elastic Compute Cloud (EC2) and Amazon Simple Storage Service (S3). Question: What is the AWS Storage Gateway service? The AWS Storage Gateway service enables hybrid storage between on-premises environments and the AWS Cloud. Question: Difference between Gateway cached volume and stored volume? In the cached mode, your primary data is written to S3, while retaining your frequently accessed data locally in a cache for low-latency. Whereas in the stored mode, your primary data is stored locally and your entire dataset is available for low-latency access while asynchronously backed up to AWS. Question: What protection was on AWS Storage Gateway? All data transferred between any type of gateway appliance and AWS storage is encrypted using SSL. data stored by AWS Storage Gateway in S3 is encrypted server-side with Amazon S3-Managed Encryption Keys (SSE-S3). Question: What is file gateway? AWS Storage Gateway service that provides your applications a file interface to seamlessly store files as objects in Amazon S3, and access them, using industry standard file protocols. Amazon Kinesis is collect and process large streams of data records in real time. The processed records can be sent to dashboards, used to send alerts and advertising strategies, or send data to a variety of other AWS services. Question: What are benefits of Amazon Kinesis? Kinesis Video Streams to capture, process, and store video streams for analytics and machine learning. Kinesis Data Streams to build custom applications that analyze data streams using popular stream processing frameworks. Kinesis Data Firehose to load data streams into AWS data stores. Kinesis Data Analytics to analyze data streams with SQL. IOPS is the standard unit of measurement for I/O (Input/Output) operations per second. Question: Amazon EBS General Purpose (SSD) volume type? Elastic Block storage(EBS) General purpose (SSD) is default volume in EC2. It is suitable for application from small to medium-sized databases, development and test environments, and boot volumes. Question: What is Aws Data Pipeline? AWS Data Pipeline is a web service that you can use to automate the movement and transformation of data. With AWS Data Pipeline, you can define data-driven workflows, so that tasks can be dependent on the successful completion of previous tasks. Question: What is Amazon Machine Images (AMI)? An Amazon Machine Image (AMI) provides the information required to launch an instance, which is a virtual server in the cloud.